An experimental therapeutic developed at Northwestern University and currently in early-stage clinical trials reversed a wide range of neurological symptoms in a mouse model of an autism-spectrum disorder, according to a study published in the Proceedings of the National Academy of Sciences. The experimental therapeutic is an inhibitor targeting a single protein kinase variant called p38α MAPK, said D. Martin Watterson, PhD, the John G. Searle Professor of Molecular Biology and Biochemistry and co-author of the study. While there is tremendous variability in autism-spectrum disorders (ASD), increased levels of serotonin in the blood are one of the most common features of disease; exhibited by about 25 to 30 percent of patients. According to the authors, this is caused to a significant extent by elevated serotonin transporter activity, which is associated with both the behavioral symptoms of ASD in addition to gastrointestinal and immune system disturbances. Several years ago, this elevated serotonin transporter activity was traced back to activation of a specific isoform of a protein kinase called p38α MAPK. According to Watterson, early efforts to inhibit p38 were too broad and had negative side-effects, causing most investigators to regard these as a poor therapeutic target. Key aspects of the kinase that were targeted during the development are shown in this cut away view of the complex. 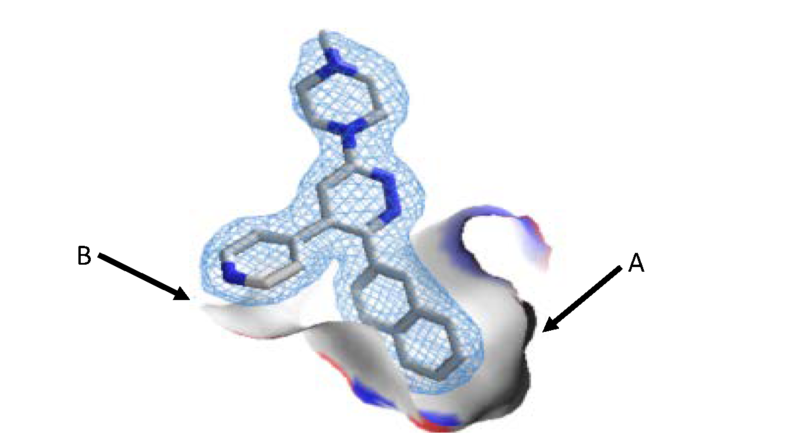 Note the extensive filling of an indentation in the kinase (A) by a component of the drug structure – like a finger fitting snugly into a glove. A proximal component of the drug structure is able to use a complementary charge interaction with another part of the kinase (B). This complementarity of drug and target in three dimensional space were key to affinity and biological selectivity of MW150. To combat this, Watterson, along with Wayne Anderson, PhD, professor emeritus of Biochemistry and Molecular Genetics, and Ottavio Arancio, MD, PhD, professor of Pathology & Cell Biology at Columbia University College of Physicians and Surgeons, focused on a stricter inhibitor, targeting only the alpha isoform. Using an innovative drug-design platform involving the merger of structural biology and big data analysis of neurology drugs, they created a small-molecule inhibitor targeting solely the α variant with in vivo function in brain disease models. This highly selective and novel therapeutic candidate was administered to mice that carry traits which mimic a specific form of ASD. These mouse models were created by Randy Blakely, PhD, professor of Biomedical Science at Florida Atlantic University. The investigators also used genetic methods to selectively inhibit p38α MAPK in specific mouse neurons, finding that they restored serotonin transporter function to a more normal state that characterized aspects of the drug treatment; localizing what was occurring with the drug at the cellular level. The results from preclinical pharmacological studies following FDA guidelines previously demonstrated that MW150 had potential for human use, and the therapeutic candidate is now in first-in-human clinical studies in healthy volunteers for safety validation, required before testing in ASD patients, according to Watterson. Combined with strategies for identifying younger patients with ASD, the inhibitor could be a powerful tool for reducing the clinical burden of ASD. The drug is currently in a phase 1 clinical trial, testing its safety in human volunteers. If successful, the next step is testing its effectiveness in human patients. The study was supported by National Institutes of Health grants MH096972, MH094527, NS007491, NS015547, DK093786 and U01AG043415; the PhRMA Foundation, the Simon’s Foundation and the Brain and Behavior Research Foundation.